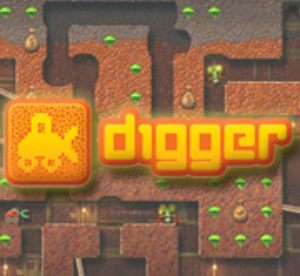 Digger HD is a modernized remake of the 1983 computer game Digger. The gameplay is basically a mashup of Dig Dug and Pac-Man. You control a tiny bulldozer underground with your job being to either collect all of the gems or kill all of the monsters. It’s a simple enough premise, but it can get a bit tricky trying to maneuver around while fighting off these enemies. In the main arcade mode, you are only given two lives to last as long as possible. When you run out of them, your score resets to zero but thankfully you can continue with the last level you left off with. I like that the game gives this option since it allows gamers to choose for themselves how easy or difficult they want their experience to be, without outright having to change the difficulty levels. Along with the 60-level arcade mode, Digger HD is bundled with a survival mode where you are tested to see how long you can last with just one life, and it includes the original classic game labeled as “vintage.” Both the arcade and survival modes can be played co-op as well, which offers a fair amount of replay value. The game keeps track of high scores, and includes an online leaderboard. While hardly anything spectacular, Digger HD is good for what it is. The new graphics look sharp and throw a fresh coat of paint on the original. I even liked the new soundtrack, which has a couple of quirky songs. What holds the game back is its repetition and occasionally floaty controls. It really bothered me when I would try to turn a corner and shoot a monster, only for him to devour me before a shot could get off. Still, Digger HD has a solid gameplay formula that can be fun to play in spurts. If you’re feeling nostalgic, you could do worse than give this classic a go.